Riding a bike is not only gratifying to the soul, but it also provides a sense of pride and fulfillment, which are key to growing you as a rider. Tommaso bikes embody all the above because they are designed with the rider's pleasures and needs in mind. Tommaso Imola, in particular, boasting of Italian heritage, is one such quality bike that is enjoyable to ride. Like all the aluminum road bikes, this entry-level bike is an ideal option to those who are on a tight budget. While being a budget bike, by all means, this bike has impressive components such as Shimano Claris groupset and will exceed your expectations. A classic definition of Italian craftsmanship, everything on this bike, from the frame, handle, the braking system to the drivetrain screams of quality and showcases the passion that Tommaso has in bike making and improving riding experience. The first thing you’ll immediately love about this bike is the design. From the first glance, it looks as if it’s ready to conquer any road in the world, and expectedly, it lives up to that. The futuristic allure on this bike makes it a desirable model, to say at the very least. Lightness and agility are a major selling point to this bike. 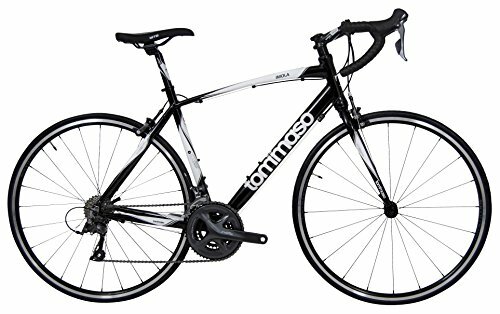 Sporting a lightweight aluminum frame in combo with an excellent gearing system, the Tommaso will allow you to enjoy perfect and swift performance that will allow cruise through different types of terrains. More to this, the smoothness of the shifters on the Tommaso are at an enviable level. Finally, an aspect that a majority of the riders pointed out is the elegance of this model. Though this is quite a subjective and personal opinion, we cannot deny the fact that Tommaso is aesthetically pleasing to the eyes. Who is the Tommaso Imola For? Imola is a great beginner level bike and will teach cycling beginners a lot. 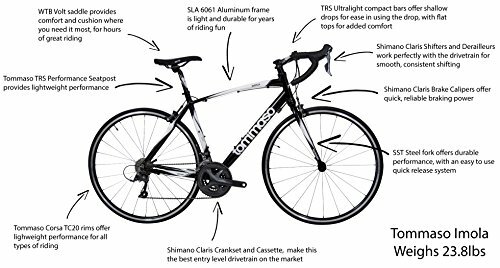 Though available at a modestprice, it is among the best road bikes to learn what makes the bike riding comfortable and great. For the experienced rider, Tommaso offers an awesome choice for biking around the town and occasional rides with a friend. The bike is designed to give you value for your money and allow you to prepare for the next level of cycling, thanks to the awesome performance it offers. Unlike Schwinn, Trek, Specialized, or Cannondale, Tommaso is not a popular brand and highly praised for no reason. In any case, it’s a low-end model, with regards to pricing, but in terms of components, it’s much more. Here are the highlights of the Tommaso Imola. One of the essential components of a bike is the frame. If it's misdesigned, the bike is more or less worthless. With that in mind, Tommaso has included a 6060 SLA Aluminum frame. While the frame material is standard across all aluminum bikes in the Tommaso price range, the frame will give you a clear balance between lightness and compactness that combine to give you durability and long-term value or your money. A major highlight to the frame structure is that it blends the excellence of an in-house design that utilizes the advances in tube shaping. Tommaso frame uses a compact geometry, which will provide a smoother ride and increased power transfer when compared to other frame geometries. Tommaso has figured a geometry that works and there no need for changing it since its frame does it job perfectly well. The shaped tubing, alongside the proprietary frame design, will enhance power transfer and allow you to meet your commuting and touring needs effectively. While the frame is robust and sturdy and does not feel like a hunk of a metal, it's not something that is designed for higher loads. Although it will manage modest luggage such as your weekly groceries, it's not to be used for carrying a heavy load, and you would be better off finding a bike with a stronger frame such as Schwinn Phocus 1400. In any case, remember the Tommaso is built for speed and performance. 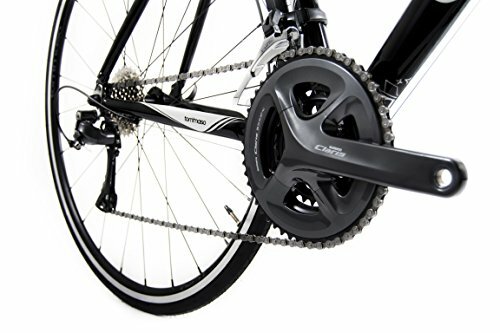 The drivetrain is where a majority of the manufacturers usually try increasing their profits by going for some low-end solutions. Tommaso, however, was not reluctant to spend a few extra dollars and fitted the Imola with a complete Shimano Claris groupset. Given its cost, a complete Shimano Claris groupset is an overkill and a high point on this bike. Imola offers 24 speeds of pure power and performance wherever this road bike takes you. 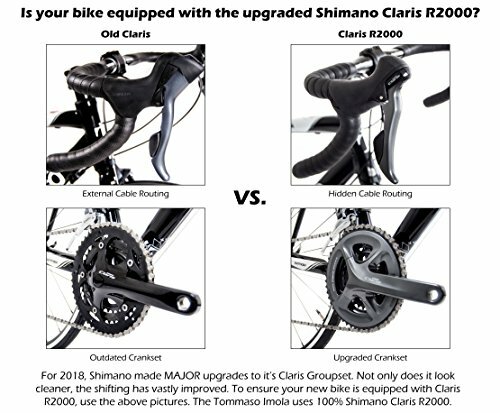 And thanks to the full Shimano Claris components, all the drivetrain components work collectively and in perfect harmony for maximum performance. Now, with these components, you’ll have plenty of gear combinations to grind your way uphill, but also keep up with your cycling buddies on more high-end models. But what is climbing and speed if you cannot stop? Tommaso is a budget bike, and we did not expect it to feature disc brakes, which is a good thing. See, disc brakes on budget bikes are in most cases bulky, heavy and often unnecessary. So, rather than bugging your performance, Tommaso utilizes mid-level Shimano Claris brake calipers, allowing you to stop on a dime. Remember efficient stopping is equally important as going fast. The Tommaso Imola features a Shimano Claris derailleurs and an integrated brake lever shifting, all who are part of the Shimano Claris groupset. Highly reliable and performance-oriented, the derailleurs work smoothly, and if you take good care of them and adjust them accordingly, you'll enjoy a seamless transition between gears. However, the derailleurs can be quite challenging to set up, especially if you're a novice and this can result in a less than efficient gear changing experience. It's therefore, recommended that you follow the manual carefully to avoid such issues, and if you're not a Dyer, you can have a bike repair shop do it for you. Aside from the derailleurs, the rest of the assembly is pretty easy and straightforward. Tommaso comes with the proprietary Tommaso Corsa TC-20. The TC-20 wheels are designed for lightness and durability. Sporting 20 radial laced spokes in the front and 24 spokes in the rear, the wheels on the Tommaso will not only support your weight just fine, but they will take the punishment of many miles of hard riding. The wheels on the Tommaso are clad with Kenda 700C, which provide an excellent width and will offer an effortless rolling devoid of a bumpy experience. Topping off the Tommaso is an upgraded Tommaso-WTB Volt saddle. Tommaso has partnered with WTB, the best saddle maker to design a saddle that will provide you with a mix of performance and all-day comfort. Considering what you'll pay for this bike, it's a bargain, particularly given it delivers in the quality and performance. Combining performance and durability, it beats all the entry level bikes competitors and makes it ideal for all the newbies and “returning” bikers.